A pretty good night’s sleep- got woken briefly by the malt lorries at 6am. Shot down to Port Ellen to get cash (again) and a thank-you present for the staff and returned to find I’d missed the morning tour – typical! 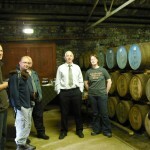 Now, what to do first…Islay Ales beer festival or Bowmore open day? Where’s that map…? 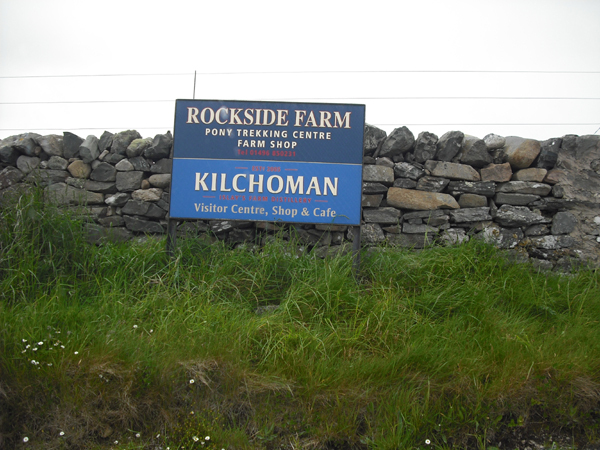 Couldn’t find the beer festival -most unusual for me - but I did find more fun roads to drive on the way to Kilchoman distillery! Definitely a farm distillery: I parked next to the sheep trailer and had to walk past the pony trekker’s tack shed and farm shop before you get to the distillery’s visitor centre. Nicely laid out inside, not too touristy/tacky and the teashop makes some of the best coffee I’ve had in a very long time. Good atmosphere among the staff as well. Laura came up to help and chatted for a bit, serving the Kilchoman 2yr new spirit. 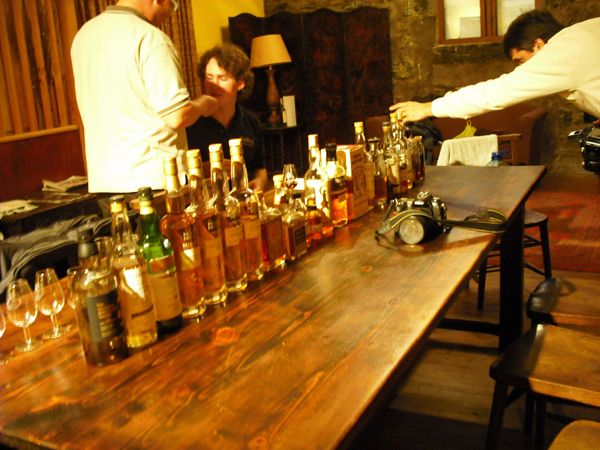 The tasting station had jugs of production water on hand to add to the dram. Homegrown, home malted barley peated to 35-40pppm makes up 40% of the production, the remaining 60% coming from Port Ellen maltings and peated to 50pppm. So, first tasting of the day: Kilchoman 2yr new spirit. 2yrs First fill Bourbon barrels. 61.3% abv. Colour: Very pale white wine colour. Nose: Definite new spirit freshness, some softness. You can smell wet barley and some vanilla. Palate: The peat comes charging in on the first taste, almost trampling the vanilla. Fresh barley again. Finish: A surprisingly soft finish, though oddly, it is the peat which fades first leaving a light woodiness to linger. With water (the yellowish production water, mmm…) this soon-to-be-whisky gains gristy, unripe banana aromas, more vanilla creaminess and something that reminds me of old-fashioned, expensive soap. The taste softens into something oilier with the finish becoming drier. The smoke lasts longer with water and a not unpleasant bitterness appears on the finish. 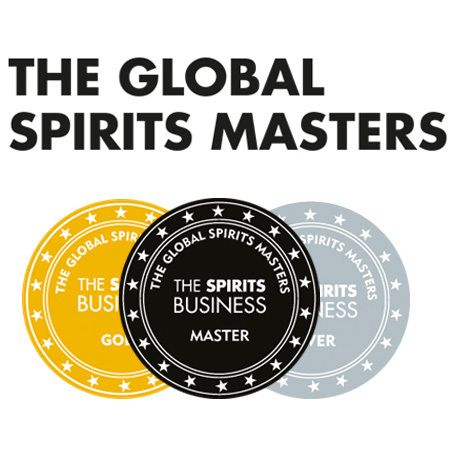 Conclusion: Hmmm – it will be interesting to see how this spirit matures. I’ve made my notes, bought my gifts and now it’s time to race to Ardbeg for my 2pm tasting. I was late getting to Ardbeg. Fun roads to drive but NOT when a bloomin’ tourist (BMW sports convertible!) can’t grasp passing place etiquette or the fact they are going 35mph in a 60 zone!!! Never mind, the nice lady at Ardbeg let me in late to the warehouse tasting, anyway. And I got to stroke Shorty on the way! I’d only missed the tasting of the new spirit which I’d already tried. Mickey Heads, Distillery Manager, seemed a bit put out – till I explained it was at a tasting in Edinburgh with Rachel Barrie at ‘Whiski’! As I was late, I had no time to grab my notebook, so no notes on what we tried, sorry. First dram: Ardbeg 6yr in refill bourbon casks. Second dram: Ardbeg 6yr in first fill bourbon casks. Definitely more buttery in texture than the first sample. Third dram: Ardbeg 10yr from first and refill bourbon casks. Fourth dram: Ardbeg 11yr in first and refill Oloroso sherry casks. Wow, what a difference! All of these drams were at cask strength which meant I couldn’t afford to enjoy them all as they deserved and still drive to my next tasting in Bowmore. 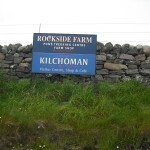 Another race across the island, courtesy of the blog boys from Caskstrength.net and the Whisky Exchange Blog. They were a man down (poor Tim! )and so had a spare ticket to an informal tasting run by ‘The Queen of the Moorlands’, a wine and whisky company based in Staffordshire. How lucky am I? 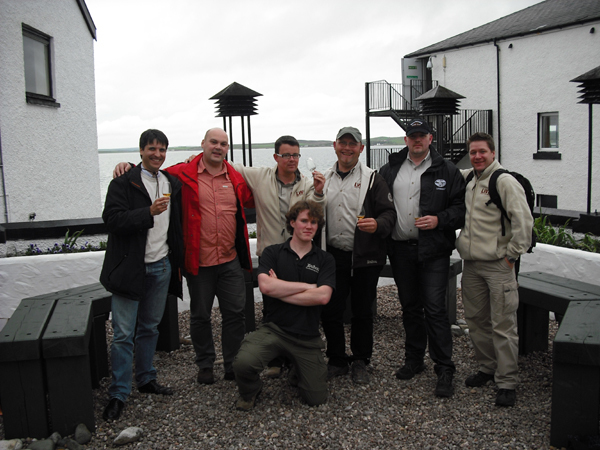 The tasting was run by David Wood and took place in the garden behind the Islay Whisky Shop, Bowmore. 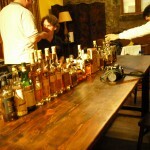 Each of the following whiskies are their own bottlings. First dram: Caol Ila Dist.1995, Bottled 2009. ‘Blacksmith’s Bottling XXVIII’. 51.6% abv. Bt 129 of 210. Nose: Still young in character on the nose, unripe bananas and grist. Palate: Very little smoke, initially ( but I have just done an Ardbeg tasting..). Unripe bananas, and slightly gristy. Second taste with water and – there is the smoke and peat, galloping in with the vanilla! Finish: Sweet smoke and a bit of coal. Conclusion: I would have preferred to have tasted this with a fresh palate, but it is quite refreshing. Second dram: Bowmore, fresh oak Quarter cask. Dist. 1998. 51.9%abv. Palate: A wood fire on a beach near a forest. Brine and sea spray, wet leaves, wood smoke. Some fruit still. Finish: Very oaky. I’ve just chewed a barrel stave, I feel. Conclusion: Another interesting dram. I found the nose more exciting than the taste, though. Third dram: Laphroaig, Festival bottling. Nose: Shortbread butter crumble topping stewed apple and blackberries. So fruity! Much less of the TCP and seaweed so often associated with this whisky. Palate: The peat sneaks in under the radar. Ripe pears on sweet biscuits. Finish: Lovely wood on the finish. Fresh and tasty. Conclusion: Jimmc from California had the right idea: Yummy! Fourth dram: Tullibardine. Dist. 1992. 55.6% abv. Bottle 295 of 346. Colour: Rose and cherry wood red. Nose: Heavily sherried, aromatic wood like cedar. Spicy. Palate: Morello cherry compote and vanilla creme brulee. Finish: A lingering, warm and creamy finish . Conclusion: Similar to a rich and decadent dessert. Something to indulge in now and again. I was persuaded to stay in Bowmore for a while and see if we could find Angus’ friends. After a quick pint (Coke!) 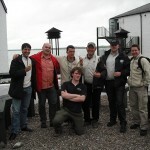 in the world famous Duffies’ Bar, Angus and I found his friends in Bowmore distillery. 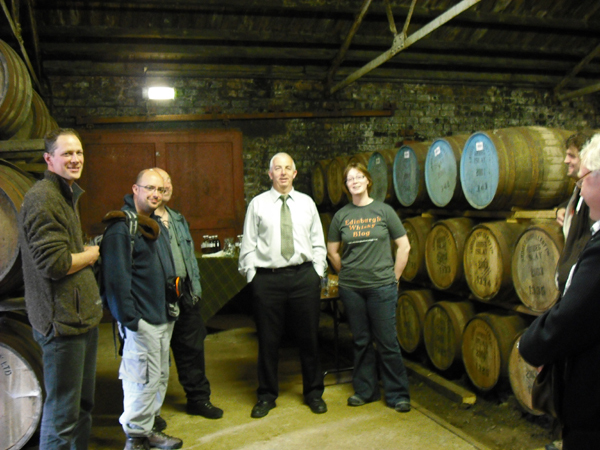 They turned out to be the Lindores Whisky Society from Belgium. They were just finishing a very special tasting of vintage Bowmores in the company of Colin Dunn, Tatiana, Euan Morgan from Morrison Bowmore (he said hello, Lucas) and Jim McEwan, Bowmore’s distillery manager. We got thrown out of bar shortly after arriving (not my fault, honest!) but the party continued outside in the sunshine. They are a great bunch of guys: Luc, Geerte, James, Billy and Dirk from the Society and Philippe, a fortunate Frenchman whom the Society had taken under their wing. I thought I knew a bit about whisky – but I am a rank amateur compared to these men; encyclopaedic knowledge (and collections) and exceptional willingness to share both! I am in awe. I think they liked how I introduced the blog, though – flashing the t-shirt was a great ice-breaker! Okay, we’ve all been to the Lochside Hotel for a meal and watched tourists sidle up and take photos of Jim McEwan at the next table. We’ve raced to Lagavulin Hall (very nice chapel conversion, complete with antler chandelier) and it’s time to start the evening’s entertainment. Parker’s Whisky, Port Ellen 1982, a.k.a ‘Pert Melon’. ‘The First For Us’ Glen Garioch, 1975-1990, Whisky et Distilleries, Le Forum. Jim McEwan’s ‘Celtic Heartlands’ Glen Moray,1962, 42yrs old. ‘Queen of the Moorlands’ Committee bottling XXVI, Caol Ila 1982. White Heather Blnded Scotch Whisky, 8yrs old, circa 1960′s. MacDonald Greenlees Ltd., Glendullan 8yrs old. Ardbeg ‘Lord of the Isles’. Ardbeg 11yrs, ‘Sympathy’, Italian bottling, name illegible from my scrawl. Murray McDavid, Glenlossie, 1972 – one of my favourite malts of the night. Kurosawa, 1st Edition, Sherry cask,18yrs old (?). An outstanding Japanese whisky. Gordon and MacPhil, Longmorn-Glenlivet, 1972-2006,Cask 1088. Lost for words on the utter bliss of having this whisky near the nose, never mind the taste buds! Thank you Billy! Douglas Laing’s, ‘Platinum Edition’ Port Ellen, 30yrs old. Mildly yummy. Lagavulin 12yrs old, White label, circa 1960′s. A rare bottle that deserves respect. Not as sweet as modern Lagavulin but has a fruity character, too often missing from today’s ‘smoke-and-vanilla’ expressions. Several eyes lit up when this appeared. I now know why. I ended up sharing the sofa bed (separate sleeping bags!) after a night of music, laughter and tri-lingual passion for the intricacies and individual characteristics of whiskies – not just Scotch. The deep-running love these men have, the dedication to not just collect but enjoy rare and unusual whiskies plus their willingness to share both spirit and enthusiasm – it is incredible. I feel privileged (and darn lucky) to have met these ‘Crazy Belgians’ as they are apparently known. I just wish I could stay longer as invited, because tonight is the REAL party night – but I made a promise and they should be kept. Sigh. 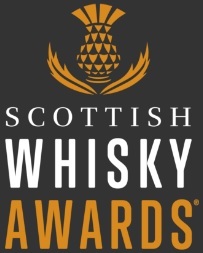 Overall, this 24hrs has to take a top spot in the top ten ever and hopefully we’ll all meet up in October for the Lindores Whisky Society’s WhiskyFest 2009 in Belgium! For more info, see their website, www.lindores.be. This entry was posted	on Thursday, June 4th, 2009 at 5:05 pm	and is filed under Events. You can follow any responses to this entry through the RSS 2.0 feed. Responses are currently closed, but you can trackback from your own site.